Archer and Armstrong deserve a movie. I would say it deserves a TV show, but concerned parents would be calling in every episode to complain, and this amount of humor can barely be contained monthly, could they handle it weekly? Luckily, Valiant is supplying us with an AA movie. San Diego Comic Con starts tomorrow. There is no such thing as coincidence. 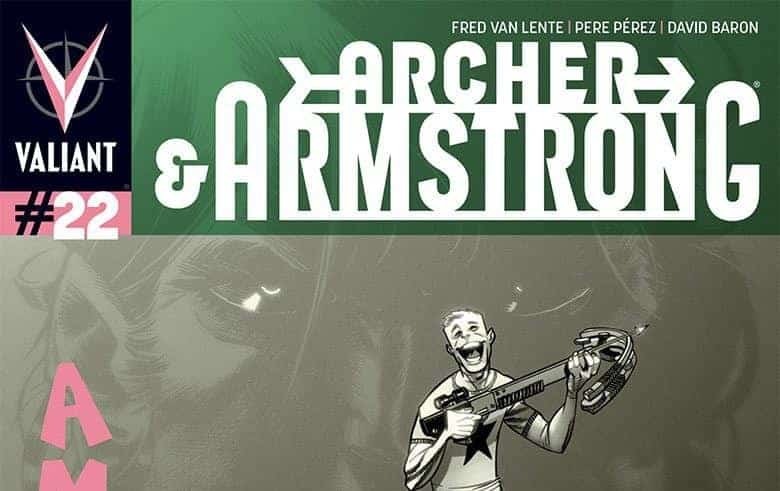 Archer and Armstrong, written by Fred Van Lente, is some of the most fun I have ever had reading comics. The amount of political incorrectness, pickled with historical fiction and fighting styles makes for grade A storytelling. The current storyline: American Wasteland adds dead celebrities to the mix. The result? Comic gold. 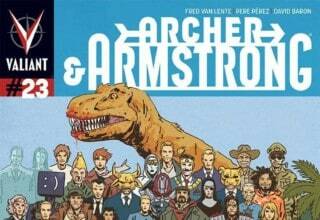 Archer and Armstrong issue 22 features American Wasteland’s third installment , out today. Writer Van Lente and artist, Pere Perez, tell an accessible story. Armstrong remembers his time working with Author Pendragon, searching for the Holy Grail in 555 A.D. The dialogue is modern, but that is what gives it a Men in Tights vibe. 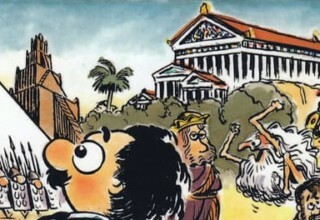 The story continues in the complex of the gods…where Amy Winehouse, Michael Jackson, and Elvis all reside. It is very chaotic as the pair attempts to escape. Mary Maria, newly time traveled to the complex, may or may not be revealed as the mother of Archer…making his father Armstrong. Could it be? This leaves a weird taste in the reader’s mouth, just imagining poor, confused Archer. I do not want to spoil the last five pages but it features a good display of Archer’s power set and a good display of Armstrong…really naked. This movie will be great. American Wasteland concludes next month. This issue was not as American as the previous ones, the crazy celebrity zombies were absent, save for Elvis. This issue, part three in a story, WAS a good jumping on point. 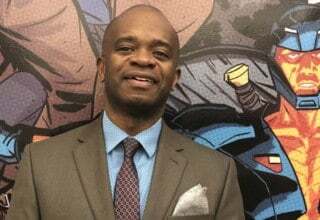 The immortal Armstrong is a pillar of the Valiant Universe. 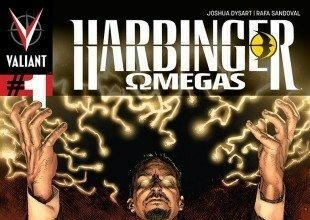 In this issue, he mentioned the Harbinger character, Bleeding Monk: “Oh, wait. You never met him. He’s a really old psychic.” This cross-over was done so seamlessly, and matter-of-factly, the result was seamless. If next month’s cover is any indication: you can see a smorgasbord of characters that have appeared in the series (parodying the Beatles’ Sgt. Pepper’s Lonely Hearts Club Band album cover. This is the right time to get on the Archer and Armstrong train. Archer’s adoptive sister/arch enemy/vessel haunted by his cult “parents”, Mary Maria, will get a one shot issue following American Wasteland, written by Karl Bollers. After that, Archer and Armstrong celebrate 25 issues with a drinking game (how else?). This is one fun, fun ride and what Van Lente is crafting works- it is his version of the characters that interests Hollywood. Next week, a special advanced look at what happens when you cross Archer and Armstrong with the other comedy duo, Quantum and Woody. Meanwhile, Bloodshot, also a sparkle in Hollywood’s eyes, has just entered the fold in Armor Hunters and Unity. His Armor Hunters tie in starts now. Armor Hunters: Bloodshot is written by Joe Harris (Great Pacific, X-Files: Season 10) with art by Trevor Hairsine (Judge Dredd). The miniseries will last for 3 issues. The premiere issue itself was a good mix of classic Bloodshot, lost in his headspace with fragmented memories of battle lines, and the present situation, an alien invasion. Bloodshot was just added to the Unity team, basically providing security detail guarding the prisoner of war, the X-O Manowar monstrosity, Malgam. He answers to Colonel Capshaw of M.E.R.O. (Military Extraterrestrial Recon Outpost), who does not fully trust the Bloodshot the nanite machine. The Armor Hunters, up in space, are targeting the Outpost. Malgam, the prisoner, and Bloodshot, the acting prison guard, reach common ground in a scene that is the emotional backbone of the story. Both are seen as half-man, half- monster. Colonel Capshaw, herself, refers to him as a dog, “until I know you’re housebroken, you’re to keep off the carpet”. Bloodshot, haunted by his past where he is feared as “the Ghost”, understands this segregation. Consequently, he is phasing out, lost in thought, when he is most needed the most. 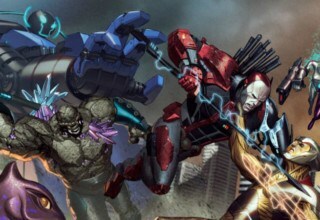 The three have great chemistry and uneasy alliances that will hopefully be further explored in the remaining two issues. The three characters are out of their element. Malgam and Capshaw are more associated with X-O and never had a chance to shine on their own. Bloodshot, fresh out of the HARD Corps (with a layover in Colombia), never was one to follow orders or be part of a real team. 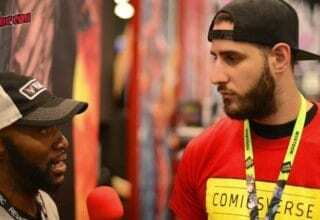 These new roles for the characters show the evolution and progression of the Valiant Universe and define that no real status quo is being followed. Hairsine’s art is really good with a striking contrast between the past jungle scenes, the space scenes, and the desert jail setting. David Baron’s colors are not to go unrecognized. The air of mistrust and confusion is ever-present in this issue. While new readers might have trouble getting situated, the three main characters are sympathetic and strong enough to demand your attention among the chaos surrounding. While Bloodshot has always been a bit overpowered, it is good to see he has met his match with Malgam and the Armor Hunters and will be interesting to see how he fares in the coming issues. 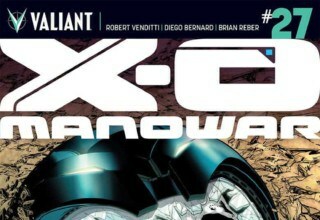 This issue is recommended for the story potential it presents for the future and the toned down characters it utilizes. I am excited to see where the next issue leads.